– Take tours of landing sites, narrated by Apollo astronauts. – View 3D models of landed spacecraft. – Zoom into 360-degree photos to see astronauts’ footprints. – Watch rare TV footage of the Apollo missions. There are lot of rare images and videos to make Moon exploration more interesting and interactive. 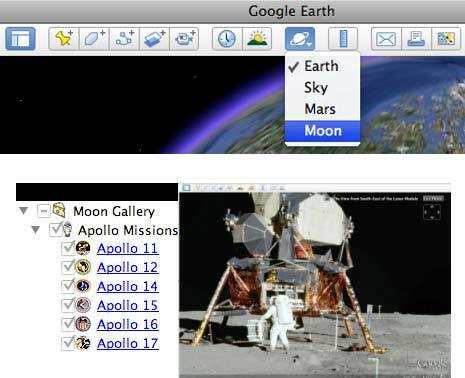 Download Google Earth [via] and explore moon like never before. Here is video teaser of Man on the Moon, it is interesting and nostalgic to the core.